Exciting news from Austin, TX! The Austin Perl Mongers are launching our very first full Hackathon. It is scheduled for late April, on two weekends, Saturday 20th and 27th. Our goal is to create a Perl class for teenagers. We will achieve this at the Hackathon by upgrading the CloudForFree platform, adding graphics, and a live development feature. The students will be able to see the result of their coding, as they write their code! It can make the learning of programming more accessible to teenagers, and it introduces them to Perl. The project managers for this Hackathon are yours truly and Bonnie Cope, a programmer and Perl enthusiast. Will 'the Chill' Braswell, creator of the platform, is one of the programming team leads. Young people in USA have been given a lot of bias against the Perl programming language. I'm glad that young people have more opportunities to learn about Perl. I run a study session called Perl Entrance Ceremony with my friends in Japan. Thank you very much for your comments! 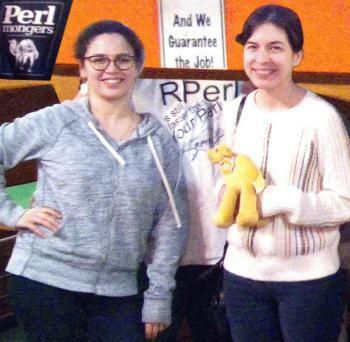 We would love to have your input on our new Perl education program. Will you please join us online for our April 20th Hackathon day? I want to talk you! My email is the following. If you would like to have an online conversation with me, please email me to know about your hackathon. I want to know about purpose and about you. I'm a friend of Perl, and member of the Team RPerl, promoting the Perl compiler created by Will ''the Chill'' Braswell.